Rewards Canada: Apr 15 Update: Does the BMO World Elite cover award ticket taxes, Emirates July Miles Accelerator offers, Last day to enter FFB10! Apr 15 Update: Does the BMO World Elite cover award ticket taxes, Emirates July Miles Accelerator offers, Last day to enter FFB10! Here is your mid week update! "Does BMO World Elite Mastercard cover award ticket (aeroplan) taxes?" And we had a simple answer. No it does not. However for a list of cards that do see this post. Beware however the post is a couple of years old so it is not fully up to date as there are now several other cards that can be used to pay Award ticket taxes but it gives you the general idea of the most popular cards that do. Our Top 5 Travel Rewards Currencies got featured on CTV's Canada AM this morning! See the video and story here. If you are planning to fly Emirates this July check out the bonus offer section below for the latest Skywards Miles Accelerator offers. YYZ is included for first class and there are lots of flights out of Dubai that have bonuses as well if you are connecting. LAST DAY to enter our first FFB10 contest! You could win 50,000 Miles & Points from Aeroplan, SPG, IHG, Alaska and Etihad + a $100 Loungebuddy credit! WestJet has launched a 2 day sale with some great fares for travel in Canada, to the U.S. and Mexico/Caribbean! Book by Apr 16 for travel until Jun 24. Find out more here. 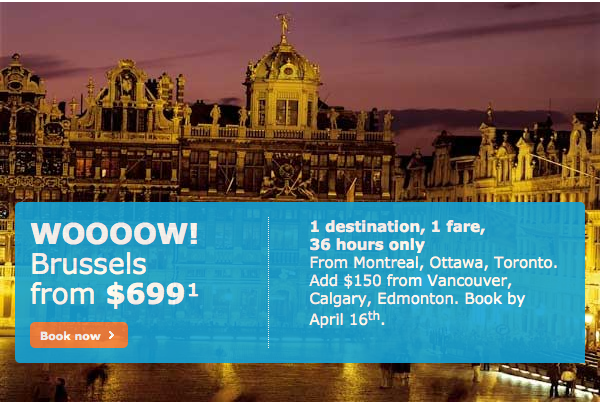 KLM's Wild on Wednesday offer is for flights between Canada and Brussels! Fares start at an amazing $699. Book by Apr 16 for travel until May 6 or Oct 16 to Dec 10. Find out more here.